Magic Straws make drinks magical. They turn essential (boring) white milk into a delightful treat that you want to drink. Magic Straws make nutrition not only palatable, but fun too. Since its initial four-flavor launch (Strawberry, Vanilla, Cookies & Cream, and Chocolate) in 2009, Magic Straws have become a vital solution for parents and caregivers across the nation who are looking for a flavorful and healthy way for children to get the essential nutrients from milk. 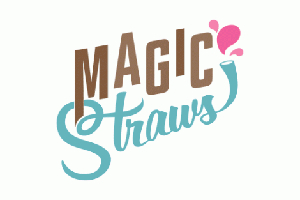 All-natural, gluten-free, preservative-free, and having only four grams of sugar, Magic Straws are a smart option for kids, encouraging them to choose milk over other beverages. Following its inception, Magic Straws has successfully partnered with celebrated brands, Got Milk? and Dippin' Dots, creating new, limited-edition flavors.